Radios and cassette players in 1970s cars. Homepage. This page: In-car entertainment for Vauxhall owners, 1970s style. Car stereos for the 1970s. Whereas in-car wireless sets have been around since before the war, they only really took off and became common fitments during the 1950s and later, usually as after-market rather than factory-fit items. The leaflet shown below describes the in-car entertainment options that were available to drivers of 1970s-era Vauxhalls. 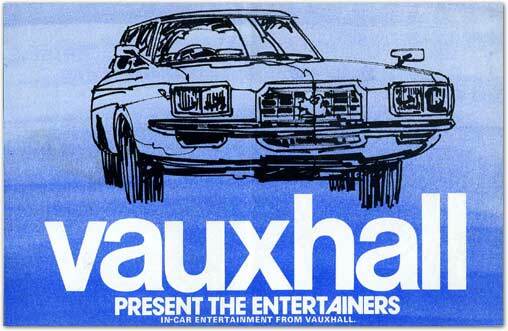 The cover of the leaflet - "Vauxhall Present The Entertainers" - features a doodle of the plush Vauxhall Ventora, a six cylinder version of the FE Victor. Did it not have a radio as standard? A choice of hi-tech car radios. Within the leaflet is a glittering selection of in-car hi-fi equipment, produced by Philips but also badged as "Vauxhall", any of which could pump out the latest tunes for 1973. 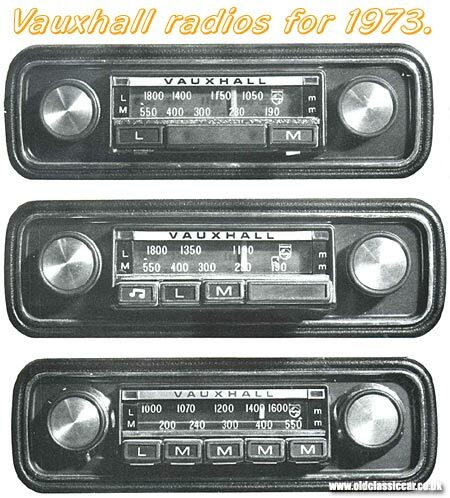 Most basic of the three is the "Vauxhall Manual Car Radio", featuring rotary volume and tuning knobs, enabling the driver to pick from the plethora of radio stations broadcasting on both Medium and Long Wave. With only 5 watts maximum output, the neighbours had little to fear from Norman ordering this unit for his new Victor. A leaflet from 1971 for a virtually identical set lists this model at £22-93. Next in the pecking order was the "Vauxhall Pushbutton Car Radio", based on the more basic offering but now incorporating 6-station pre-selects and an element of tone control - heady stuff. List price for this radio just two years earlier was £29-13.5. Real disco fans though would probably have plumped for the top-of-the-range, "Vauxhall De Luxe Pushbutton Car Radio", as it featured improved tone control and station selection, thanks to "... [a] five featherlight button panel for finger tip station selection ...". Still only 5 watts though, probably enough to drown out the whine from a tired back axle but your hearing was safe. Note the wobbly line of buttons - acceptable in 1973 perhaps, but I doubt a buyer of a modern Vectra would be that impressed. To buy this radio in '71 would have cost a whopping £36-63.5. Anyone serious about music on the move though would want to be able to choose their own tunes, rather than rely on Tony Blackburn or Dave Lee Travis to play their choice of music. 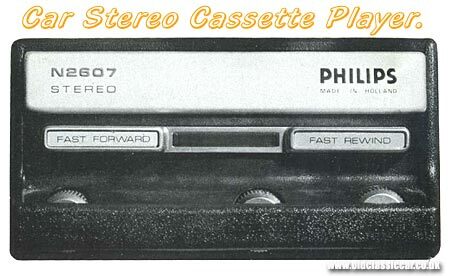 Enter the Philips N2607 stereo cassette player. Prior to the widespread adoption of compact cassettes, motorists may well have equipped their car with an eight-track cartridge player to enjoy their own choice of artist. Eight-track cartridge players were a definite improvement over in-car record players, but the cartridges were chunky things and only contained a finite number of different tracks. Compact cassettes though - starting with the C60 (2x 30 minutes) upto the C120 (2x 60 minutes), could hold far more songs and took up much less room in the car's glovebox. More space for string back driving gloves, clip-on sunglasses and sideburn trimmers then. The downside to the Philips N2607, and other players similar to it, was that they'd need mounting somewhere in, or underneath, the dashboard, in addition to the radio. By the late 1970s, radios including cassette players were becoming the norm, but earlier in the decade cassette players were usually standalone units. The controls on the N2607 were not too demanding. Three roller buttons controlled the tone, stereo balance and the volume, while two more took care of fast rewind and fast forward. Ejecting a tape required the user to push both buttons at once. Any Vauxhall dealer could supply the accessories you might need for your radio installation. Different radio aerials were available, the most basic being a telescopic aerial that fitted to the car's front wing. Live in a rough area? perhaps the lockable aerial would be a better bet. Anyone who really wanted to impress George and Mildred next door, or work colleagues, could splash out on a whizzy electric aerial, extending to 33" in under 5 seconds at the touch of a switch within the car. For the "surround sound" experience, there was the option of fitting a 6.5" diameter circular speaker within the rear parcel shelf, guaranteed to "enhance overall acoustical performance". A balancer, or fader, between the front and rear speakers could also be specified, handy if you had children asleep in the back who might not appreciate the latest warblings from Cliff or The Bay City Rollers. More information on this subject can be found on the classic car radios article page.